& Newport News, VA, July-August 2006. 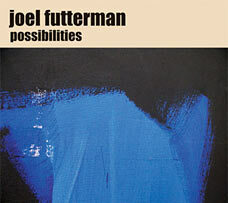 “Possibilities” presents Joel Futterman in a rare solo recital, one in which the foundational elements of the music, such as the blues, boogie-woogie and stride, color each performance. The three twenty plus minute pieces, “Part 1”, “Part 3”, and “Part 4”, present the album's core, with “Part 1” demonstrating a blues-tinged melodicism morphing into a fiery torrent that evokes initial cadences before full-tinges modality and concluding passages of jagged comers. “Possibilities” is a single composition comprised of seven parts or movements. Each movement links with and references what has come before it generating an inherent sense of wholeness and coherency to this recording.